According to the British newspaper The Times, the Russian Air Force has forward-deployed a contingent of six of its most modern fighter-bombers to an airbase in Syria. Since Russia typically doesn’t have its latest frontline strike aircraft cross-train with the Syrian military, especially while the latter nation is embroiled in a vicious civil war, it can only be assumed that this latest deployment is for the purpose of bolstering the Syrian government’s forces by providing an air support capability to troops fighting against anti-government insurgent groups. 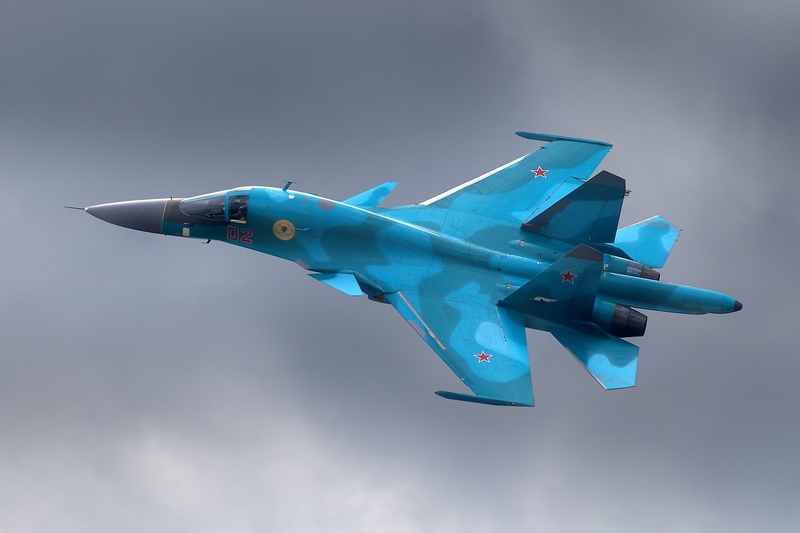 The Su-34 Fullback joins an increasing Russian presence in the country, adding to the Su-25, Su-24 and Su-30 jets that “snuck” into Syria by cloaking their radar signatures, flying underneath larger cargo aircraft entering Syrian airspace. Let’s take a quick look at the Fullback, shall we? Built by Sukhoi, it looks like the result of a duck-billed platypus mating with an Su-27 Flanker to create a very potent multirole strike fighter with excellent handling characteristics in a wide spectrum of environmental conditions. The Fullback was born in the late 1980s, closer to the dissolution of the Soviet Union than executives at the Sukhoi bureau would have liked, looking back in hindsight. Dubbed the T-10V, the aircraft was indeed designed to capitalize on the Flanker’s best features, namely payload, range and maneuverability. However, instead of a traditional in-line cockpit for both the pilot and the navigator/weapons officer, Sukhoi decided to take crew comfort into account and build a larger, pressurized flight deck which is actually roomy enough for either of the two crewmembers to take a quick stretch. There’s also a small galley, and a toilet for… err… in-flight emergencies. In fact, the cabin behind the seats is large enough to unroll a sleeping bag and have a quick snooze on long missions. If you haven’t yet noticed the visual congruencies, the Fullback shares most of its fuselage composition with the Su-27 and the Su-30, including the tail structures, the wings and underbody engine nacelles. However, to add agility, Sukhoi engineers added a pair of functional canards near the wing roots. Granted a pair of powerful Saturn AL-31FM1 turbofans as its powerplant, the Fullback can achieve Mach 1.7-8 in a supersonic dash, even with a full weapons load. On the subject of weapons, the Su-34’s twelve external hardpoints and internal 30mm GSh-30-1 rotary cannon makes it a force to be reckoned with, especially for enemy ground forces who have a limited anti-air capability. Though the Russian Air Force primarily intends for the Fullback to be a strike aircraft more so than a fighter, that doesn’t mean that it can’t engage in a furball every so often. To that end, it’s capable of slinging six R-77 medium range radar-homing and six R-73 short range infrared-tracking air-to-air missiles. Additionally, the Fullback comes with a built-in electronic countermeasures system (ECM), a rearward facing radar, and a passive electronic scanned array radar up front, linked up to an advanced fire control system. The rear-facing radar allows for R-73 missiles to be fired on attackers flying behind the Su-34 without necessitating re-positioning the aircraft in order to counterattack.The Russian Air Force intends to procure the Fullback en masse as a service-wide replacement for the aging Su-24 Fencer attack fighter, with plans to build and buy 200 units. Though rumors do exist that the Fullback got its first taste of combat in 2008 when Russia invaded the Republic of Georgia, this appears to be the Su-34’s first official combat deployment. All in all, the Russians seem to have built themselves one hell of a strike fighter. Copyright: Oleg V. Belyakov, 2009.